The MetroStars today called up goalkeeper Jeff Cassar from the Atlanta Silverbacks of the A-League for the upcoming game on Saturday, September 21, against the New England Revolution. Cassar, 28, is being called up to serve as a back up to Paul Grafer for this weekend's vital Eastern Division showdown with the Revolution. Tim Howard is unavailable for the game, as a result of a red card received this past Saturday against DC United. Jeff, who joined the team today, totaled six games, a 1-3-1 record, 519 minutes, and 21 saves after signing with the Silverbacks on July 31, 2002. 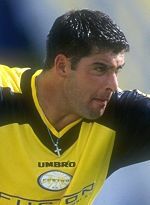 He also recorded six saves on August 9, 2002, in a 1-0 exhibition win over the MetroStars, which included a penalty kick save in the fifth minute. The Livonia, Michigan native has played in MLS with the Miami Fusion and Dallas Burn.